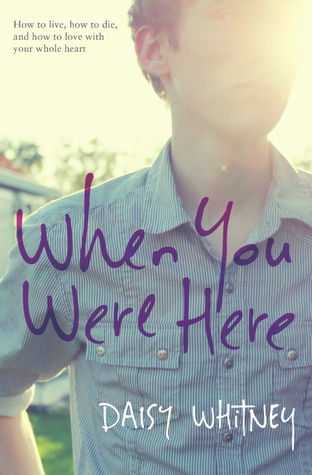 The Official Blog Tour for WHEN YOU WERE HERE by Daisy Whitney with an Exclusive Video and Giveaway! Can I just say, I was thrilled when I was asked to be part of The Official Blog Tour for WHEN YOU WERE HERE by the lovely and talented Daisy Whitney. There is nothing I love more than promoting books and authors that I love. When he gets a letter from his mom’s property manager in Tokyo, where she had been going for treatment, it shows a side of his mother he never knew. So, with no other sense of direction, Danny travels to Tokyo to connect with his mother’s memory and make sense of her final months, which seemed filled with more joy than Danny ever knew. There, among the cherry blossoms, temples, and crowds, and with the help of an almost-but-definitely-not Harajuku girl, he begins to see how it may not have been ancient magic or mystical treatment that kept his mother going. Perhaps, the secret of how to live lies in how she died. And because I love love you, dear blog reader, you get an exclusive (never before seen) video of Daisy in Japan! One of the things I really enjoy, as a reader and writer, is a character that is sometimes hard to love. I usually find these characters to have the most epic internal journeys and growth, which makes them really interesting to me. For me, Laini was that character in WHEN YOU WERE HERE. Yet, despite my frustration with her (and it got ugly at times LOL!) I couldn’t let her go. But I’m so glad i didn’t it. She had her own pain and she reminded me that I shouldn’t judge until I’ve walked two moons in someone else’s moccasins. Did you plan on having Laini turn out the way she did or was she a force of nature that simply took over when you were writing? Yes! Thank you! Laini was always a bit cold, and she had her reasons. Being hard to love was a part of her character makeup from the start. She has a chip on her shoulder and she believes she has reasons for it. As such, she was a hell of a lot of fun to write with her sternness and self-righteousness! But I also think her relationship with Danny shows that while you might not ever be close with a sibling, you can at least respect and understand their choices. And though she’s nearer to brittle than not, I think Danny ultimately “gets” her. If Laini could relive the last several years of her life, would she do anything differently? She wouldn’t have left the family the way she did. She would have gone back and said the things she needed to say to their mom sooner. But she’s glad she eventually said them. Family is a strong theme in WHEN YOU WERE HERE, the presence and the absence of it. What would Laini tell readers about family? Embrace them. Love them. Don’t run from them. Don’t assume you know everything. Daisy, you wrote a book that crosses cultural barriers in a wonderful way. As our world shrinks and becomes more and more interconnected, books like this become even more important. What do you think was Laini’s most important contribution to the cultural theme in WHEN YOU WERE HERE? While I didn’t intend this as I wrote her, I would say she typifies how families today are created. She’d an adopted daughter from a foreign country, and the identity challenges she faces are ones other adopted children may confront. But she also feels an intense, deep-seated love for her homeland, and I think the depth of her love for China – a complex and fascinating country – is important to consider in our global world. If WHEN YOU WERE HERE were a television series, Laini and Kana would be the characters I’d most like to see in a spin off series. Have you written the rest of their stories in your head? Would you ever consider giving us more Laini? I have considered writing a story for Kana! I thinks she would be a fascinating main character. I often imagine a handsome British boy sweeps her off her feet. Perhaps that’s because I like British boys.